Susan Primo, OD, MPH, Emory Eye Center’s director of Vision & Optical Services and a co-investigator on the I-SIGHT study. Interactive telephone calls and tailored print materials helped glaucoma patients adhere to their treatment better, but not significantly as compared with a control group. The report on a randomized controlled clinical trial was published online first by the Archives of Ophthalmology, a JAMA Network publication. A 2006-10 study, the Interactive Study to Increase Glaucoma adHerence to Treatment (I-SIGHT), was initiated to try and help non-compliant patients adhere to glaucoma treatment goals. Funded through the National Eye Institute (NEI)/National Institutes of Health (NIH), the study proposed to develop, implement, and evaluate an innovative e-health communication intervention to improve glaucoma treatment compliance among more than 300 patients recruited from two eye clinics in Atlanta. The intervention was telephone-based and utilized interactive voice recognition technology. It was individually-tailored to participants’ compliance knowledge, attitudes, and behaviors; health literacy; race and culture; and prescribed medication regimen. Its hope was to have a significant impact on public health by testing a generalizable and affordable health promotion strategy to increase treatment compliance among diverse populations. Susan Primo, OD, MPH, Emory Eye Center’s director of Vision & Optical Services and a co-investigator, got the I-SIGHT study off the ground when she teamed up with colleagues at Emory’s Rollins School of Public Health, including Jay Bernhart, PhD, MPH. Ultimately, Karen Glanz, PhD, MPH, then at Rollins, secured needed NEI funding for the study. Glanz, director of the Emory Prevention Research Center (EPRC) at the Rollins School of Public Health until 2009, was principal investigator at Emory prior to joining the University of Pennsylvania, Philadelphia. At her departure, Beck became the PI at Emory. Glanz and colleagues enrolled 312 patients with glaucoma in a randomized controlled trial at two eye clinics at a Veterans Affairs hospital and a large public hospital, Atlanta’s Grady Hospital. The patients (average age nearly 63 years) were considered to be non-adherent because they did not take their medication, refill their medicine and/or keep their medical appointments. Patients were divided into either the treatment or control group. The treatment group received automated, interactive telephone calls and tailored printed materials, while the control group received usual care, which included the recommendation for medical appointments and medication refills. Researchers measured adherence to medication taking, prescription refills and appointment keeping based on interviews, medical charts and other data. “A statistically significant increase for all adherence measures was noted in both the treatment group and the control group in the I-SIGHT (Interactive Study to Increase Glaucoma Adherence to Treatment) trial. The treatment group had greater improvements in adherence in 4 of 6 categories, but this did not reach statistical significance,” the authors comment. Researchers suggest that “motivated patients” in an ongoing clinical trial might improve their treatment adherence even without tailored messages for encouragement. Glaucoma affects more than 2.2 million adults over the age of 40 in the United States. It is the second leading cause of blindness in the world, according to the World Health Organization. Medication prescribed early on can reduce the visual field loss caused by glaucoma, a progressive disease. It is crucial that patients take their glaucoma medication and follow up with appropriate medical appointments, as the devastating effects of glaucoma are not seen until the later stages of the disease. Glaucoma reduces peripheral vision, and those who have it often don’t know it. Glaucoma should be detected early in order to stop the progression of the disease. Dilated eye exams are important in detecting glaucoma. Ref: (Arch Ophthalmol. Published online June 11, 2012. doi:10.1001/archophthalmol.2012.1607. Emory Eye Center has a mission to conduct pioneering research into blinding eye diseases, to educate and train eye professionals, and to provide excellent patient care. 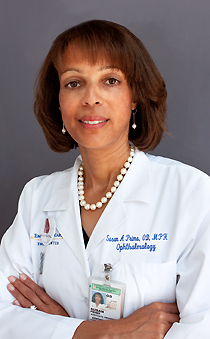 The Department includes 33 ophthalmologists, eight optometrists, 11 basic scientists, 11 post-doctoral fellows, and nine researchers in other Emory departments who hold joint appointments in the Emory University School of medicine’s Department of Ophthalmology. Ophthalmology research is supported by current NIH funding of $23.8 million. The Department remains in the top rankings (#15 in 2011) by U.S. News & World Report for the 15 years the magazine has held a ranking for Ophthalmology. It also ranks in the Top Ten in the peer-reviewed Ophthalmology Times annual report.